Most of you are familiar with lavender's remarkable ability to help relieve physical pain, both through direct application to the skin and through aromatherapy inhalation. Lavender is often used for scented home goods, and there's a reason. Lavender will not only ease physical discomfort but can reduce mental distress and even mild depression as well. A recent review study published in Evidence-Based Complementary and Alternative Medicine, outlines lavender's effects on anxiety and depression. For example, the reviewers found three clinical trials that showed a daily dose of 80 mg/day of lavender oil helps relieve subsyndromal (mixed) anxiety disorder, generalized anxiety disorder, restlessness, and agitation. Another study of 221 patients with anxiety disorder found that lavender relieved their anxiety better than a placebo. It helped with their restlessness and sleep issues and improved their quality of life overall. And lavender doesn't just outperform a placebo. In fact, a six-week study of adults with generalized anxiety disorder found that lavender's effects were comparable to those of a 0.5 mg daily dose of lorazepam (commonly known as Ativan). One study even found that the scent of lavender made dental patients less anxious in the moment, though it didn't make them less anxious about having to return to the dentist in the future. 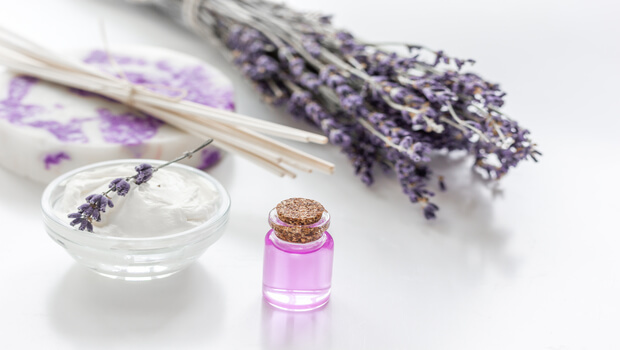 Aromatherapy with lavender helped relieve anxiety and improve mood in intensive care unit patients, while adding tea tree and rosemary to the mix helped people in a long-stay neurology in-patient department ease their psychological distress and improve their moods. When it comes to depression, a clinical investigation of 48 adults suffering from mild to moderate depression found that adding a lavender tincture to the antidepressant imipramine led to better, faster improvements. The researchers also found that the lavender helped reduce some of imipramine's side effects, such as dry mouth and urinary retention. Anxiety and depression can both be serious conditions, so you should get a doctor's help in treating them. Never, ever discontinue a medication for anxiety or depression without your doctor's supervision. But you can speak to him or her about incorporating lavender into your treatment plan, and see how you respond. And if you don't have ongoing issues with these conditions but do experience mild, occasional anxiety, try diffusing some lavender essential oil in your home or office. It can make a difference before a stressful day. Try rubbing two drops of a high-quality lavender essential oil in your palms and then cup your hands around your nose and inhale. You can also rub whatever is left on your hands at your temples or even your feet and relax.